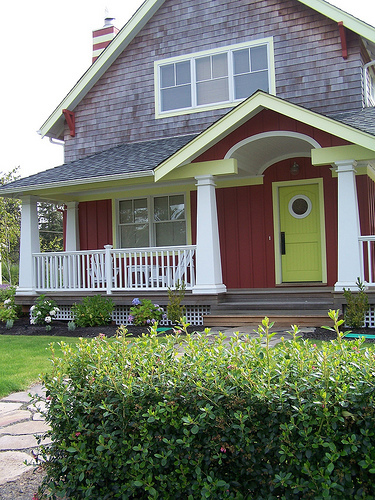 7 Colorful Front Doors & What Color Should I Paint Mine? I love colorful front doors. This is an old picture of my front porch and door (the decor has all changed over the years but the door has remained the same!). As you can see my door is natural wood on the outside, and you might remember I painted it black on the inside. I’m not really a fan of this particular wood tone on my door so I definitely want to paint it. But what? Black? A pretty color? I’m not sure yet! I’d love to paint or stain my whole house a soft gray with white trim like this lovely house of my dreams. But painting my entire house is definitely not going to happen this year. Darn. But maybe I will finally get to paint my door and the trim around the front door and sidelights? What color do you think I should try? 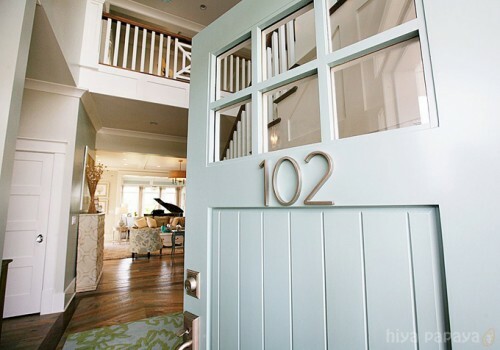 To get inspired, I rounded up a few colorful doors! I think I like the green, the yellow, the orange and a blue. And, a little more subdued but still striking, maroon doors. What is your favorite door color? See what I ended up painting my front door here! British brand Farrow & Ball, try Brassica, or Pelt if you are feeling daring! I like the softer blue with your house. Have fun picking! I LOVE red for front doors. As a kid, I was a huge fan of the popular (in my town) tan house with white trim, black shutters, and bright red door. Appreciate your selection of inspiration photos. Love them all and, like you, immediately jump to wanting to repaint my entire house just to get an orange door! Love any shade of blue! 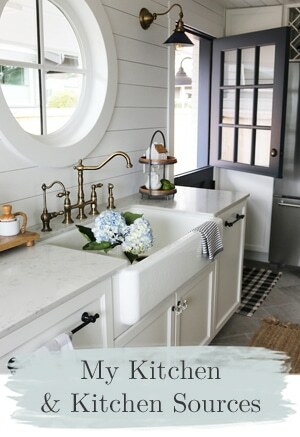 I love the soft blue with white trim. Sorry, but it’s all about a black door for me! Especially on a lighter house. Although red would be my second choice. Unfortunately neither of these work on my house – we have maroon though and that works. We have a red front door, so I am partial to that! Aqua would be my second choice. I have a a door painted majolica blue. It brings out a touch of blue oxide in the our brick. 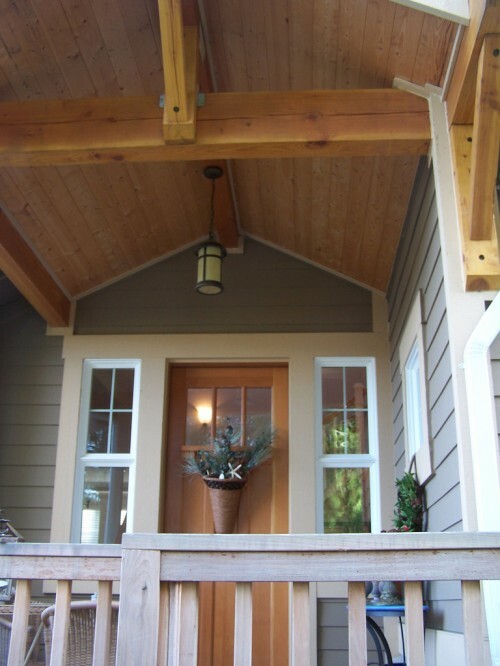 And I love front doors so much I have a whole board of them on pinterest! I recall visiting Dublin and seeing all of the *brightly* painted doors and hearing the tradition started there in protest when the British government asked that they all be painted black. Also heard it was to differentiate the nearly identical Georgian style homes there… Our front door is burnt orange and I can’t imagine not having a colorful front door — go for it! 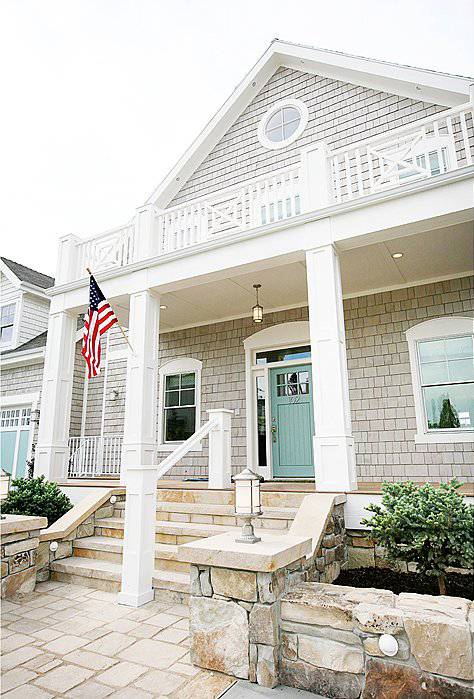 So quick to do, easy to change, and makes an amazing improvement to curb appeal..
Our front door is painted Seaside Resort by Benjamin Moore. Our ranch style house is a terracotta brick color and it needed a pop. The front door does it! I like the blue door but I really like black doors the best. Beautiful pictures. I love front doors too. I love the first 2 blues. I also love a yellow door. Currently we have a red door which is very nice and classic I enjoy red too. Have a fabulous day! My door is turquoise–a hybrid color that I mixed out of a bunch of paints I had. My house is a red brick, so finding a color that wasn’t black and that suited me was a bit of a challenge. My neighbor painted hers a lovely yellow, so I couldn’t do that…the color on the house is happy and actually looks pretty with the brick–BUT the lime green looks awesome and if I get bored…watch out! Oooo, I’d love to see a pic of your door. That sounds like a color that would work w/ our rock. I love the green…yellow…and actually the lighter tealy-blue from the gray shutter house! Love the pop!! 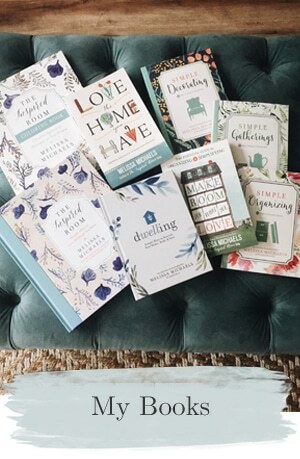 Love all this inspiration! I was just looking for ideas yesterday for our doors. We have a pale yellow house with white trim. I love the first turquoise you showed for your house… gorgeous! I love the Wythe blue door. I love anything sea and that color spells relaxing and inviting t me. Something you want you house be. The house of your dreams is the house of my dreams too! I think I discovered it when I first discovered Pinterest and pinned almost every room. It’s gorgeous inside and out. But, until you can redo the exterior of your house, I vote for some shade of orange. Orange exudes happiness. And if you still have lots of guests regularly what a fun way to greet them. I want a new front door, one I can paint. I’ve been going over colors trying to decide what I would do once we change the door. You shared some great colors here. The first one is my new favorite color and I think would be great for your house. I want to see a picture of the door mentioned above in comments, by Franki Parde, sounds interesting! The beautiful gray house with the scrumptious blue front door has long been my absolute favorite! Hiya Papaya has great taste!! If you want a real pop I love the green. No maroon in my opinion! And dark grey over black would be my advice! Will be fun to see what you decide. Make sure it’s what YOU will love! And remember it’s only paint – you can change it if you end up not liking it as much as you thought! 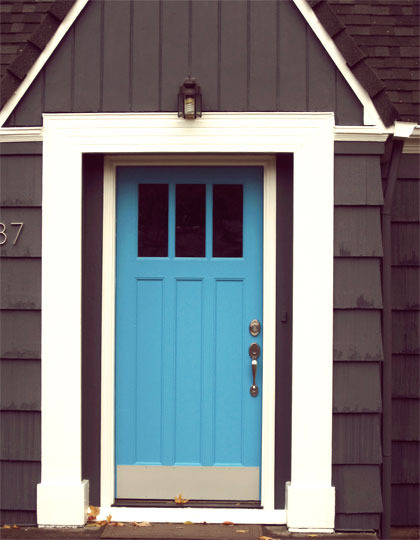 I love red and orange front doors, but I can just see your front door in a nice blue similar to the little table that shows in your picture. Love all those colors! My thought on the orange, though, is it won’t provide enough contrast (if that’s what you’re going for) because of the tone of your natural wood. My current front door is blue (house is buttery yellow with creamy white trim)…but we need a new door so bad!!! I am enamored with black doors on light-colored houses, but our house has the “orangiest” brick halfway up the front that I have ever seen, so I think it might turn out too Halloween on my house :(. I’m thinking turquoise for me! so inviting! i want to walk through every single one! I love the lime for your house! We had a red front door for years and we just painted it white last summer. I love our crisp, clean white after years of such a bright color. 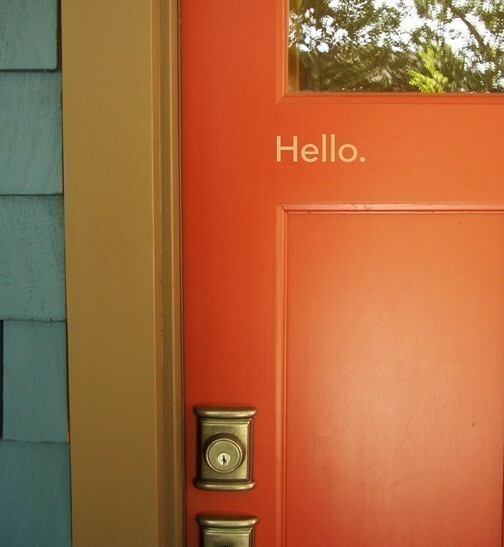 But the beauty of a front door is it’s so easy to change – with paint! May I ask who built your house? Yes, Bushnell Homes was the builder. ooooo! so hard to choose. 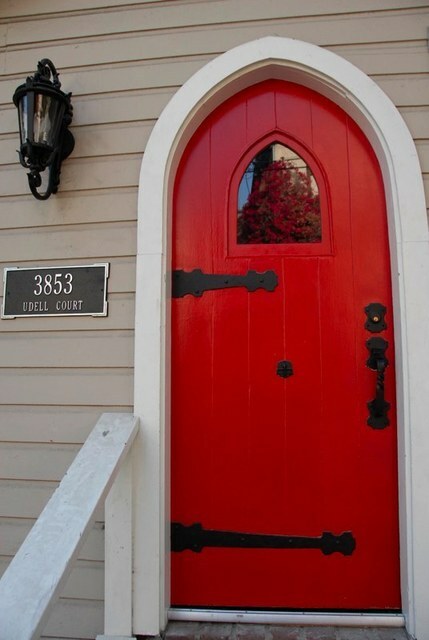 I have always wanted a red door, but our house is red brick and it just wouldn’t work. I love yellow for a front door. Our door is actually a dark grey. I like it. It suits our house. I think any bright colour you choose would be great! 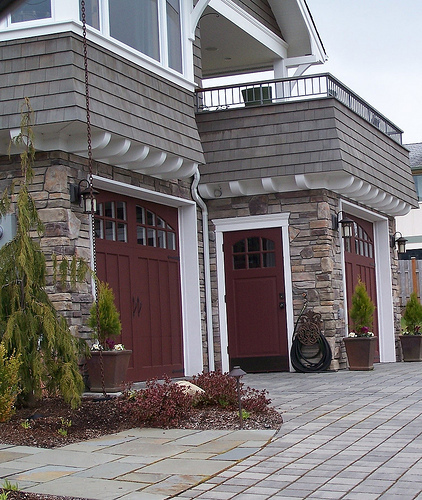 I love the front door color and garage door color of “your dream house”! I have a question: our house is a beigy yellow with a dark green door (It has a large window in it) and dark green shutters. Can you have the door and shutters two different colors? What colors would everyone suggest for the door? I really like the lime green……but would also entertain other colors. You can definitely do the front door a different color than the shutters, but they should compliment each other well. 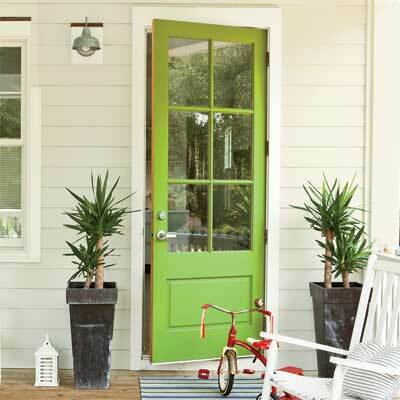 A lime green door with forest green shutters would not work. But I bet you could do a red door! Red and green are opposites on the color spectrum so they actually work very well together. Thanks Camille. I was thinking along that line also. I’ll save the lime green for something else……. It is actually kind of a taupe brownish color, and parts of it is shingled and part is rock. I wish we had been involved in choosing elements of this house but it was already done and built by the time we bought it! You should do it a lovely turquoise! It would look great with the white trim and grey siding! what will make you smile when you drive up and what will look good when the door is open into your home. When you answers those two questions it will help you figure out what colors are good. I really think a yellow door would be great… I know you’ve mentioned in the past wanting things to be more sunny due to your locale. It would have to be just the right yellow… but I think it could be fantastic! Love all the painted doors. They are so welcoming. For your soft grey house, I think your door would look fabulous in Jalapeno by Sherwin Williams. Also, if you haven’t already discovered it. Sherwin Williams has a Color simulator where you can upload a photo of your front porch and play with different colors for your front door. It’s pretty helpful when choosing a pop of color. Good luck!!! definitely go for a blue….maybe a bit brighter, but not turquoise. Of the doors you pictured, the Wythe Blue is by far my favorite. It’s so nice that I’m thinking of using it for my next front door color. I really like my current door color, too: Glidden Mediterranean Blue. To me, the shade on my door looks much better than the way it looks on my computer screen. I have a teal door and LOVE it. I love the wythe blue front door! All of the doors are pretty, but I think that’s my favorite! I’m voting for the orange door…still enough of a contrast with the rest of you color scheme, but can be beachy in the summer and of course, gorgeously autumnal in the fall!! Post a pic when you decide and paint! I just painted mine last week… Peacock! I used Behr’s Peacock Tail. I originally wanted Sherwin William’s Oceanside. It’s just a tiny bit bluer, but a long line at Home Depot prompted me to choose from their line rather than wait for color matching. So, I vote Peacock. I love it. Hmmm..with a taupish brown, I’d pick the teal or softer blue. I just love a pop of color, however keeping in mind that the front door shouldn’t make you wonder what on earth could be on the other side of that door?! This is a very interesting question. I never thought of door color as an issue. I don’t have a home so it’s still not for me. but after watching design shows on HGTV I see why people make such a big deal about it. I like red or charcoal gray or green or teal doors. 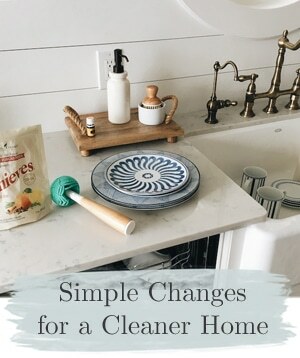 With what I can see of the actual colors on your home already I like the “light” turquoise (not the dark) and it will also tie in with the entryway colors you just changed when you come in. Since there was not a full sized pic of the house it was kinda hard to tell. So that is my vote! I have not been a fan of a lot of red doors when they do not match the style of the house, but I love the bright red on that Udel Court Pic, and the shape of the door and black hinges REALLY set it off beautifully. 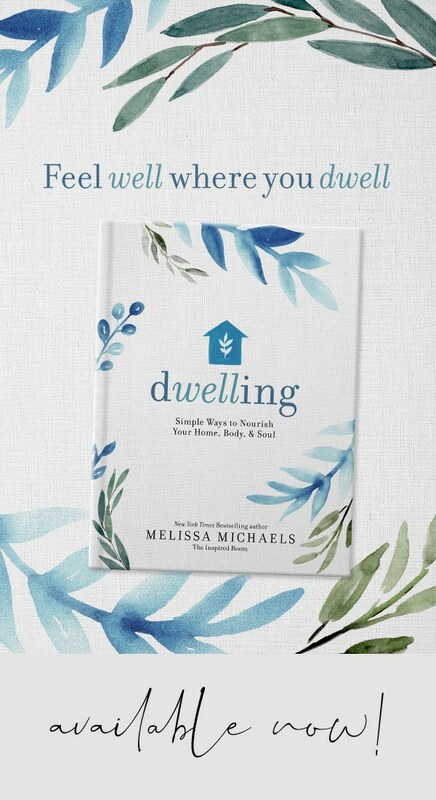 I love the aqua one on your dream house! It reminds me of something that would be by the water or on a cottage. I think an interesting, tasteful color on the front door makes people take notice and makes the house stand out from the crowd. I also love black doors, I think they are sharp and usually contrast great with almost any house color. I love the green door because it is my favorite color.. And actually it looks nice as you enter the house..
Our house is sort of a taupe color and we painted the front door a dark red, Sundried Tomato from Sherwin Williams. We painted the front and the back, so we see it from the inside also, and really love it. We painted ours orange – had Behr paint colour matched for Benjamin Moore’s Citrus Blast. It makes it a lot easier for people to find in our crazy mixed up neighbourhood! That said, I think the next time we paint the door, I’d like something more of a burnt orange – darker than what we have now, but not too dark. I followed the feng shui suggestions for door colour – depending on which position your front door faces, different colours are suggested. Love the turquoise! Can I just say, I found your blog & added you on my google+…I don’t use my google plus & hadn’t visited your site in a while. I’m a new reader at inCourage & I read your most recent post there today. I’m excited about how God is connecting me online! Awesome!!! So glad we’ve connected! I am a punch of color fan-I have done the red door thing and honestly is is so over used I think the Turquiose is fresh!!! I think Periwinkle would look great on your beautiful home! I love the turquoise with the rest of the colors on the front of your house. It will look stunning! 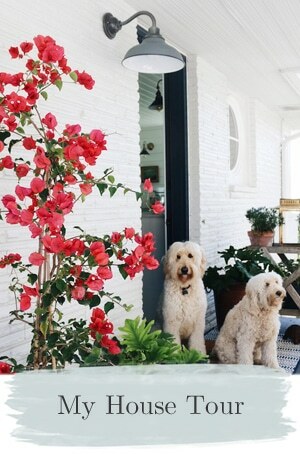 I grew up in a whitewashed brick house with a bright red door — loved it…and it perfectly fit my mom’s personality. I think the light turquoise or light blue would look fab on your house and be a nice transition to the other colors in your home. Love, love, love the wythe blue door and plan to repaint mine that color this summer (it’s currently a bluer blue). I saved that same photo for inspiration and funny, the peak inside looks just like my home. We are also re-doing the railing upstairs and I had already made a sketch very much like the one in the photo for our builder. Confirmation! Close second is turquoise and the orange is really pretty and different. 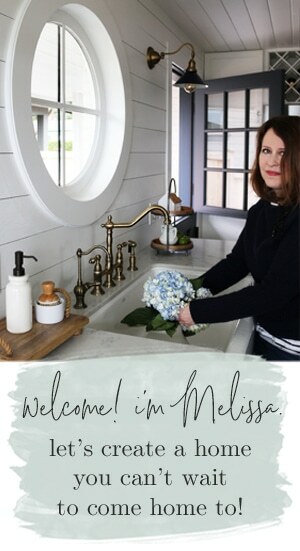 Wow this is such a great post…i’ve been thinking about what color to paint my front door for the past couple of weeks. I’m definitely debating either to go for the turquoise or bright red…decisions, decisions! Well…I guess you better not ask me b/c I love your door like it is!! Out of the doors that you posted I really like the turquoise. Today, I realized that I think I want a yellow door. Decisions!! We painted our front doors turquoise and we love them!